made it, we will show you how we verified it. The list below, while not complete, does represent the majority of our inspection equipment and tooling. We have many other tools that are specific to certain jobs and processes that are not listed here. (1) 36.0 inch x 24.0 inch granite Surface Plate. (2) 18.0 inch x 12.0 inch granite Surface Plates. with forward/backward digits. .001 inch graduation. 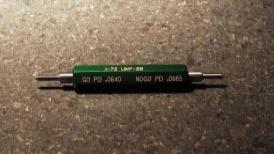 (4) Tesa test .0001 inch graduation Indicators. (3) 0.0 to 3.0 inch travel, .0005 inch graduation Indicators. 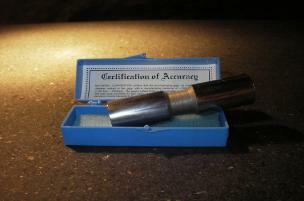 (3) 0.0 to 1.0 inch travel, .001 inch graduation Indicators. (1) 0.0 to 6.0 inch travel, .001 inch graduation Indicator. (1) 10.0 inch x 10.0 inch x 10.0 inch precision Angle Plate. mistakes. Your satisfaction is our first priority. table size is 12.0 inch x 3.0 inch. screen has 360 degree x .5 degree increments. cross hair 10x 30x 40x resolution. digital indicator heads -x- and -y- axis. especially for some of the very small ones. (1) .011 inch dia. thru 1.00 inch dia. Guage Pin Set. 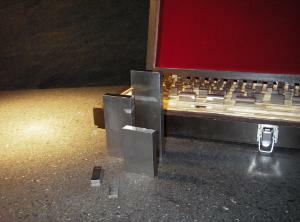 (2) .050 inch - 4.00 inch Gauge Block Sets. 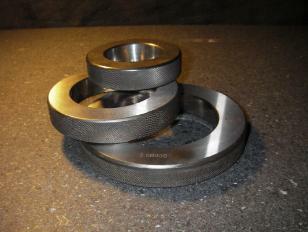 (20) 0 - 80 thru 3/4 - 10 go/nogo Inch Thread Gauges. (14) M2 x .4 thru M22 x 1.5 go/nogo Metric Thread Gauges. We have a thread gauge for every hole we thread. (1) 0-48.0 inch/metric scale type Caliper .001 inch graduation. (2) 0 - 12.0 inch Digital Calipers .0005 inch graduation. (2) 0-12.0 inch Dial Calipers .001 inch graduation. (1) 0-8.0 inch Dial Caliper .001 inch graduation. (7) 0-6.0 inch Dial Calipers .001 inch graduation. (3) 0-6.0 inch/metric Digital Calipers .0005 inch graduation. block standards for checking calibration. (1 set) 0 - 12.0 inch Micrometers .0001 inch graduation. (1 set) 0 - 6.0 inch Micrometers .0001 inch graduation. (1 set) 0 - 4.0 inch Micrometers .0001 inch graduation. 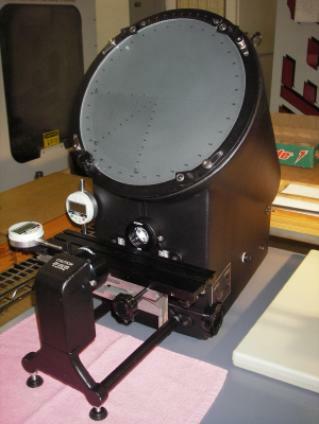 (2) 0 - 1.0 inch Micrometers .0001 inch graduation. (1) 0 - 2.0 inch Anvil Micrometer set .0005 inch graduation. (1) 0 - 9.0 inch Depth Micrometer Set .001 graduation. (1) 0 - 6.0 inch Depth Micrometer Set .001 graduation. (1) 1.0 inch - 12.0 inch inside diameter Bore Micrometer Set. (1) 0 - 6.0 inch "t" style Bore Micrometer Set. 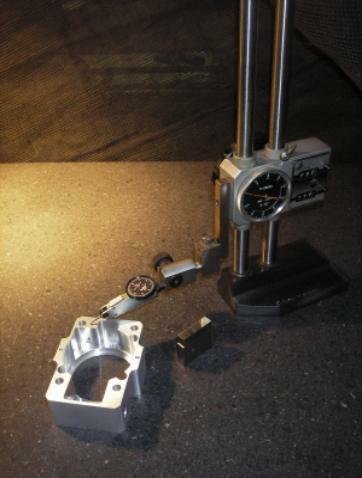 inch graduation with Ring Gauge standards for calibration. (1) Pitch Gauge Set, range 4 thru 80. 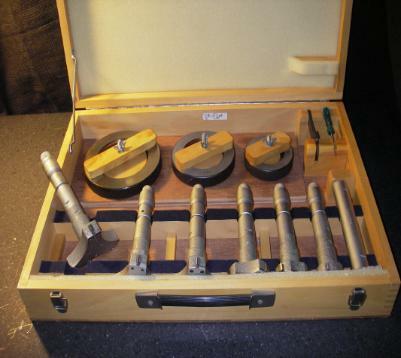 (1) 32 Sample Surface Finishes Gauge Set.